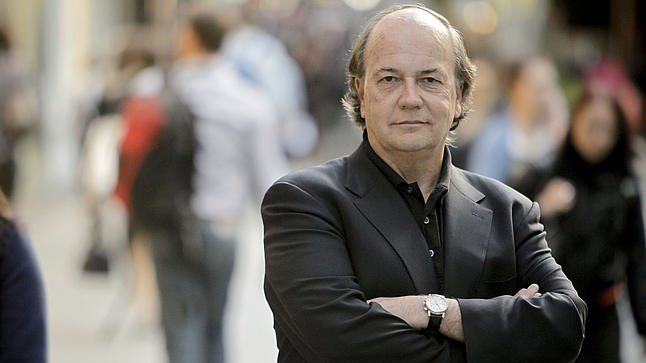 A synopsis of an interview with Jim Rickards, New York Times bestselling author of The Death of Money, Currency Wars, and the newly released bestseller The New Case for Gold by Pauline Chiou at CNBC. 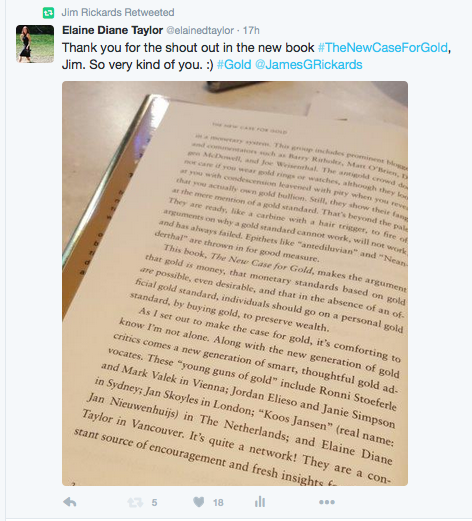 Think of gold as a form of money. As money it competes with other kinds of money — the dollar, euro, yen etc.. They’re all like horses going around a race track. Gold is starting to go up but will go a lot higher. People think of gold as being up or down, but instead think of gold as being the constant with the U.S. dollar going up and down. 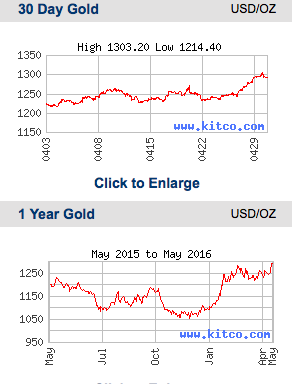 So, the dollar price of gold is going up right now but that just means the U.S. dollar is becoming weaker. If you want to understand where the price of gold is going then just ask yourself where you think the price of the dollar is going. As a result of the Shanghai Accord reached on February 26th, the U.S. dollar has seen its highs and will now go a lot lower, which means the dollar price of gold will be going up. This bull market in gold is just beginning as we see the efforts of the G4 — U.S., China, Japan and Europe — take down the dollar. The currency wars started back in 2010. The U.S., China, Japan and Europe would each like to have a weaker currency to make their export prices lower, but it’s impossible for them to all be weak at the same time. They have to take turns. August 2011 was the all time low for the dollar and at the same time it was also the all time high for gold. That’s no surprise. Since then it has reversed to highs for the dollar and lows for gold. From 2011 to 2015 we’ve had a strong dollar against the other currencies, but now the U.S. is close to a recession and needs a break. At the same time China’s growth has slowed down dramatically and dangerously. China and the U.S. are the two largest economies in the world and they both now need weaker currencies. That means Japan and Europe will have to suffer the stronger currencies. The finesse is to keep the dollar/yuan crossrate unchanged. Some say that China didn’t devalue, but they devalued a lot. They devalued against the euro and the yen, which together are a larger trading partner for China than the U.S. is. Everyone manipulates their currency — it’s just a matter of whose turn it is. At the IMF Spring meeting about two weeks ago, Christine Lagarde said to Japan not to dare weaken the yen. Now the U.S. Treasury is saying the same thing to Japan. Jim sees the yen going to maybe 100 to the dollar, with probably the euro going to 120 to the dollar. Japan and Europe have to get stronger currencies so that China and the U.S. can have weaker currencies. Japan would like a weaker yen, of course, but they just had three years of a weak yen and they didn’t make the structural changes they needed to make. The deserts of Nevada are beautiful and there’s time alone to research and write. Australia just devalued their currency to fight in the currency wars. Puerto Rico is reeling with it’s debt burden, and gold hit $1,300 U.S.
Let’s take a look at gold over a month over and a year. It’s creeped up over the past month, which makes sense if it’s being manipulated as has been shown clearly now on many fronts. If you follow the daily goings on you’ll see this week it jumped $26 one day, then slammed down. A controled burn is the prefered method of change. Those in control don’t want to lose it and don’t want opposing thoughts to join together and form a bigger opposing block due to a shock. All is peachy. Bread and circuses will continue so as to keep as many eyes off the problems as possible. Does anyone else see a bit of the gladiator games in Game of Thrones? Maybe it’s just me. At least a government will promise bread & circuses until those in the game of Coins & Crowns are able to get themselves out of the way before winter comes. I tend to look at the micro and macro when I’m connecting dots. Kind of a Marshall McLuhan thing combined with a Hermetica “as above so below” thing, mixed with past experiences of what people with power do. I guess that makes it an Elaine Diane thing.